The lawyers at Breakstone, White & Gluck in Boston are representing patients who have suffered injuries from the Ethicon Physiomesh® Flexible Composite hernia mesh. If you have been treated with this medical device, you should be aware that the product has been recalled. Patients may face a risk for infections, hernia recurrence and the need for additional surgeries. Ethicon, a subsidiary of Johnson & Johnson, voluntarily recalled the Ethicon Physiomesh® Flexible Composite hernia mesh in May 2016, after two unpublished analyses which determined that the Ethicon device failed at higher rates as compared to similar hernia mesh repairs. The law firm of Breakstone, White & Gluck represents clients in Massachusetts, New Hampshire, Rhode Island and across New England in defective medical device claims. If you have suffered an injury, contact our law firm today to learn your rights at 800-379-1244 or 617-723-7676. You can also use our contact form. Ethicon Physiomesh® Flexible Composite hernia mesh is a sterile, low profile, flexible composite mesh designed for the repair of hernias and other fascial deficiencies. It was approved under the Food and Drug Administration's controversial FDA 510(k) clearance. The FDA allows products to be approved under this accelerated process if a company demonstrates the product is substantially equivalent to an existing product already on the market. The unpublished analyses that reported these complications were conducted by the Herniamed German Registry and Danish Hernia Database. The analyses found the Ethicon hernia mesh had higher failure rates than similar hernia repair devices. 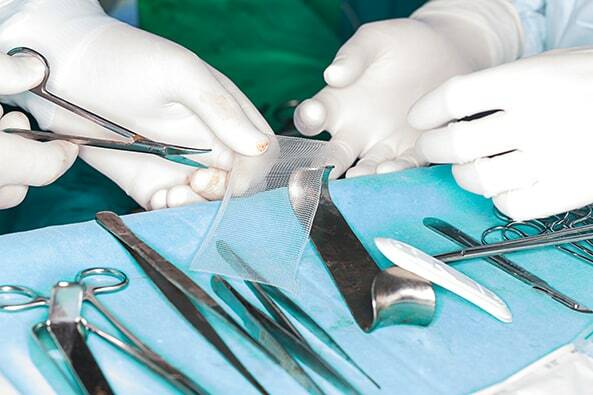 Ethicon is not the only hernia mesh manufacturer to face injury claims. In 2011, C.R. Bard agree to pay $184 million to settle 2,000 claims brought by patients treated with the Composix Kugel Mesh Patch. The patch had a special “memory recoil ring,” which allowed it to be folded, then inserted through an abdominal incision. But once inserted, many patches failed to stay in place, causing patients to suffer symptoms such as bowel obstruction and pelvic inflammatory disease. If you have experienced any pain, it is important to make an immediate appointment with your physician or be treated at a hospital emergency room. Then contact an attorney who specializes in these types of cases. Our attorneys are here to explain your rights and guide you through the process. The Boston product liability lawyers at Breakstone, White & Gluck have over 100 years combined experience representing clients who have been injured by defective medical devices, including transvaginal mesh and DePuy hip implants. If you have been injured, learn your rights for seeking compensation. For a free legal consultation, contact us at 800-379-1244 or 617-723-7676 or use our contact form.